You probably didn't know that sangrita (the Tequila-chaser) was invented by one of Pancho Villa's wives because she felt that Tequila was too strong for her. 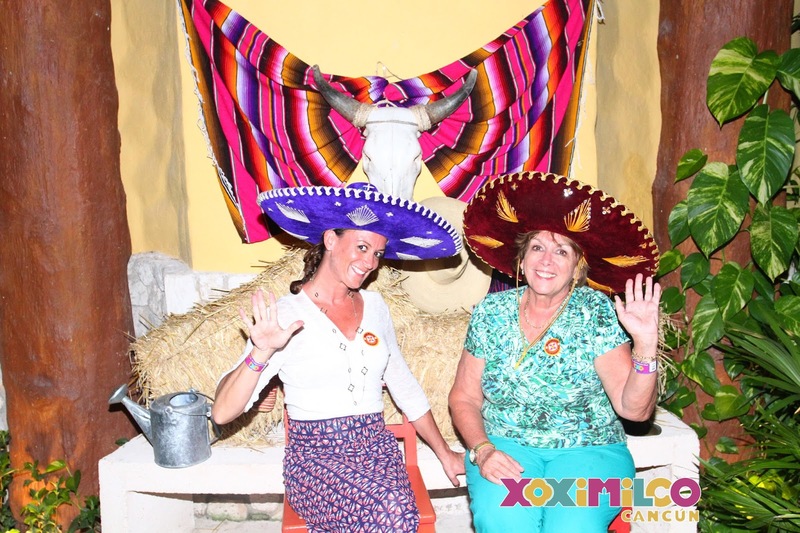 That's just one of the tidbits of trivia you're apt to learn when experiencing Cancun and the Riviera Maya's, newest attraction: "Xoximilco Cancun" a floating fiesta, promising entertainment, colorful anecdotes, history, good food and drink - and three hours of sheer delight. 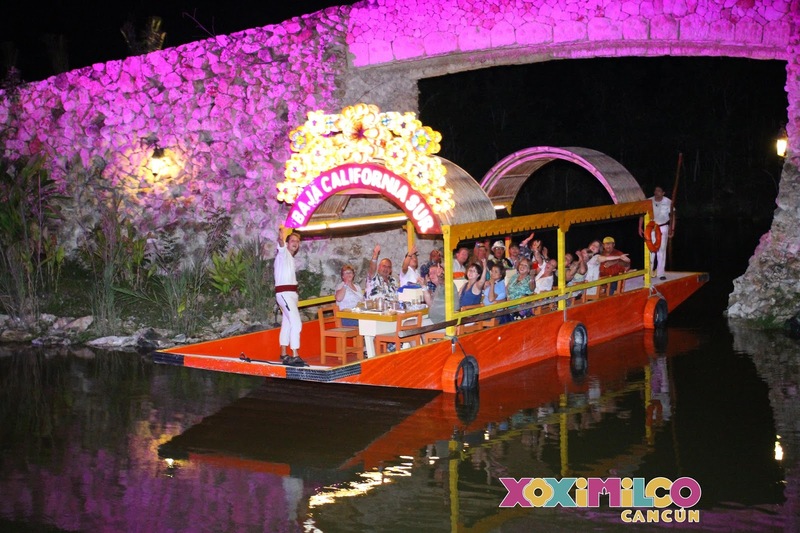 Sprawling along nearly 150 acres in abandoned limestone quarries, just 10 minutes from Cancun International Airport, the area's newest attraction is a replica Mexico City's ancient Xochimilco - only better. 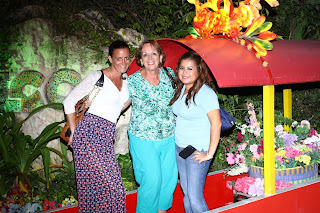 The party begins as soon as you arrive at the festive site with colorful flowers, music, refreshments and a small gift shop combining with musical trios and colorful photo "ops," to kick off the fun-filled evening. When you arrive you'll be given the name of the trajinera (boat) you'll be boarding and once the marine bell rings, you head off on your "cruise." 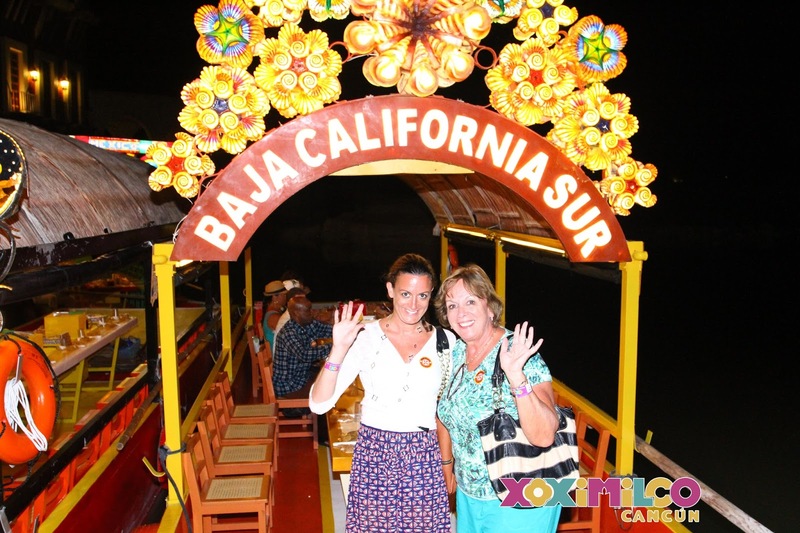 Once on board, different musical ensembles glide by, treating you to traditional live music, including: mariachi, bolero, jarocho and marimba medleys as you wind your way along the scenic canals. Trajineras are decked out with distinctive decorations, named for the country's 32 states. With each barge holding up to 20 passengers, 10 on each side of a long banquet-style table, the fiesta begins. In the middle of your table a chilled compartment holds ice, beer and water, while Tequila, lime and sangrita are all within easy reach. 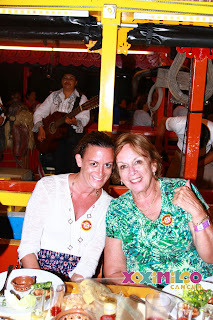 Each boat has a rower (many of them have worked in the original Xochimilco in Mexico City) and a "host" who ensures that you are entertained - and fed along the way. 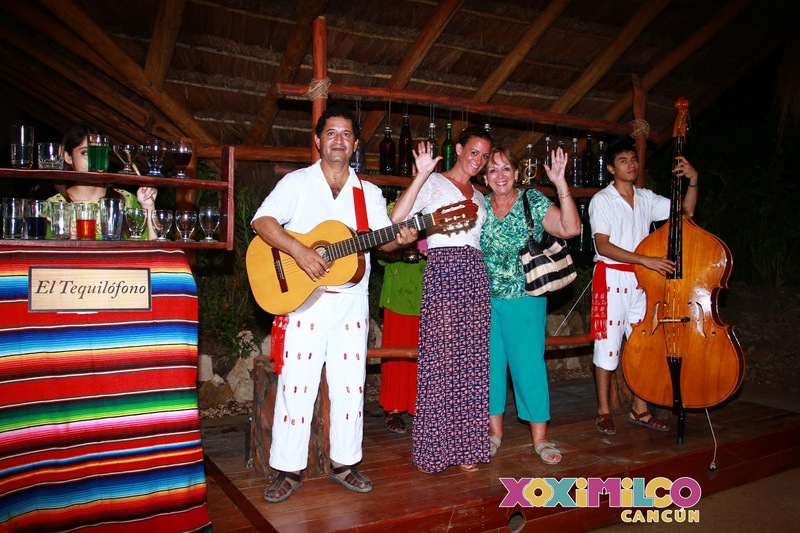 As you make your way along the wide canals - serenaded by music barges passing by - your host regales you with Mexican legend and lore. Along the way you'll be treated to a somewhat Disneyesque with replicas of small villages, shops and even a church lending a sense that you're cruising through a small town, as you are led through a series of songs and games. This attraction is not to be missed. A very tasty dinner - served in three courses - features cuisine from different regions of Mexico and is incredibly "choreographed." While you're cruising, refreshments flow as your salad is served. When those dishes are cleared away, a barge appears out of nowhere, as servers discreetly board with your entree, quickly disappearing again into the darkness. Soon after - and half-way through the cruise - passengers disembark for approximately 45 minutes to tour a small "village," take photos, use restrooms etc., allowing the crew to magically clear the dinner dishes in your absence. Once you're back on board, typical sweets and coffee are served as you make the final journey to return to the dock. It is truly a masterful - and fun production. 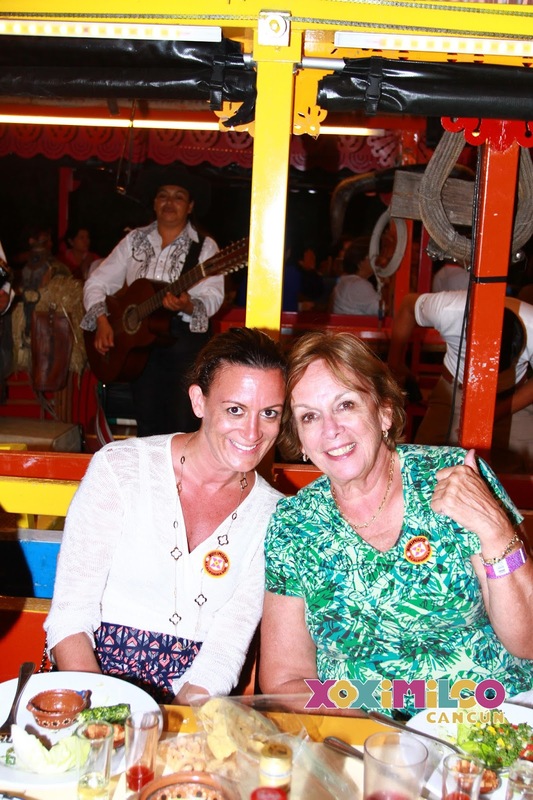 Tour packages run USD $107 per person and includes transportation from your hotel, admittance to Xoximilco, dinner with an open bar, and the three-hour cruise. Various discounts are offered for early online bookings. Cost without transportation is USD $89 for adults, USD $44.50 for children 5 - 11 years old. This tour is not recommended for small children. Mosquito repellent is highly recommended - and is provided at no cost before you board your trajinera.